It happens to me surprisingly often. I’m half skimming, half reading a fairly interesting article—all the way until the last word. But as soon as I’ve finished, I’ve already forgotten what I’ve read. If you want readers to remember your words, you need to invigorate your message and jump-start your readers into action. And the easiest way to do that? Write clincher sentences. 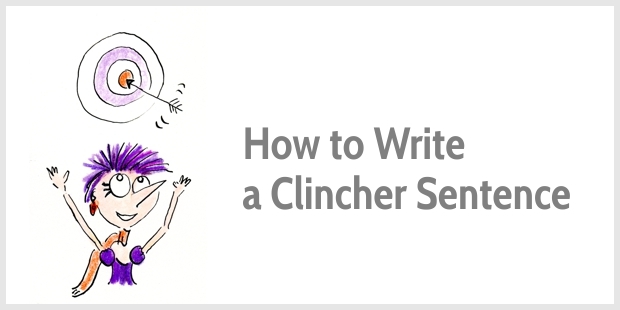 Eh … what is a clincher sentence? A clincher sentence is a concluding sentence reinforcing your key message. You’ll find clinchers as the last sentence of a well-written blog post, essay, or book chapter; or at the end of a section in a blog post—before a subhead introduces the next section. A clincher sentence is a soundbite, communicating a nugget of wisdom. It’s a memorable point that may linger in your reader’s mind long after she’s finished reading your content. Want to know how to write these powerful sentences? In his memoir “My Father, the Pornographer,” Chris Offutt ends most chapters with excellent clincher sentences. (…) I realized the landscape would always hold me tight, that I could never escape, that in fact what I loved and felt most loyal to were the wooded hills, and not my father. Dad seldom left the house over which he held utter dominion. When he did leave, he went to cons, an environment that assuaged his ego in every way. He grew accustomed to these two extremes and became resentful when his family failed to treat him like fans did. We disappointed him with our need for a father. If writing was a boxing match, the clincher sentence would be the knockout blow. But how do you deliver a killer punch? To write a clincher sentence, you first must know your key message. So, think about this: If readers would remember one thing from your article or book chapter, what would it be? If you can’t think of the key message, your idea might still be a little fuzzy. Let it simmer for a while, and then revisit your post. Which question do you want to answer? What problem do you help solve? What is your key tip? In educational or inspirational writing, you can use the two-punch approach. Firstly, remind readers what you’ve explained already. And secondly, nudge them to implement your advice. This is the most simple and basic component of life: our struggles determine our successes. Stories have the amazing dual power to simulate and to inspire. And most of the time we don’t even have to use much creativity to harness these powers—we just need to be ready to spot the good ones that life generates every day. Remember, your clincher sentence is the killer punch encouraging readers to implement your advice. My favorite type of clincher sentence sketches a vivid image, giving energy to your key idea. A week after the memorial service [of my father], I took Mom to a greenhouse built of plastic sheeting. Mom selected a plant with white flowers, then smiled, shook her head, and chose red flowers instead. She took the red ones home. After fifty years Mom planted flowers she liked in her own backyard. The real value of money begins when we look beyond it and see ourselves as better, as more valuable, than it is. When it’s not about the accumulation of stuff but rather the enactment of experiences. When it’s not about the mug but rather the coffee that’s in it. Vivid images haunt readers, popping up in their minds hours—or even days—after reading your content. Do you always need a clincher sentence? At the end of a book or blog post, you don’t have a choice. To avoid your writing petering out, finish with a clincher sentence. However, at the end of a book chapter or blog post section, you can choose. You can either look ahead and make readers curious to read on, or you can look back and summarize your key message. 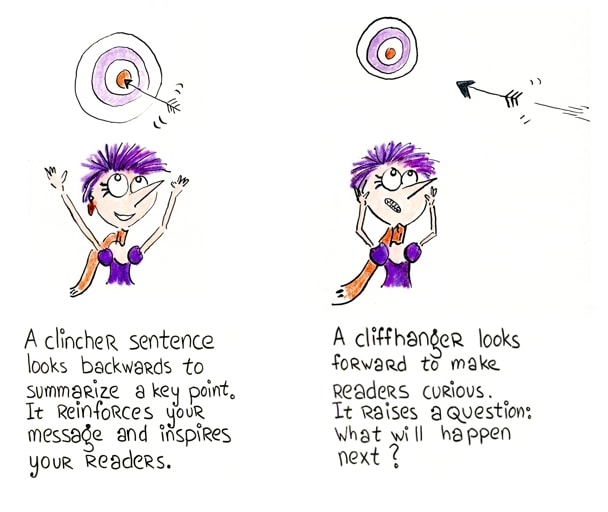 To look ahead, use a cliffhanger to raise a question and make readers lean forward, eager to learn more. For instance, in the gripping book “American Kingpin: The Epic Hunt for the Criminal Mastermind Behind the Silk Road,” Nick Bilton uses cliffhanger sentences at the end of each chapter. And yet, as he hopped into the car next to his sister, he also didn’t know that in just five years he would be making that amount of money in a single day. But what wasn’t clear to either of them, as they rolled around on his dinky bed in the basement, was that the relationship they were about to embark on would be the most tumultuous romance of Ross’s and Julia’s adult lives. And, for Ross, it would be his last. Before I started reading the book “American Kingpin,” I already knew the outcome. I knew Ross Ulbricht gets jailed. Yet, the narrative is so gripping and the cliffhangers so compelling, that I couldn’t put the book down. I wanted to know exactly how the story unfolded. Can’t choose between a cliffhanger and a clincher sentence? You don’t have to choose. You can use them both. We may make only a handful of conscious, considered choices every day. But while these decisions don’t occupy much of our time, they have a disproportionate influence on our lives. The psychologist Roy Baumeister draws an analogy to driving—in our cars, we may spend 95% of our time going straight, but it’s the turns that determine where we end up. This is a book about those turns. In the chapters to come, we’ll show you how a four-part process can boost your chances of getting where you want to go. So, at the end of a section or book chapter, you have three options. Write a cliffhanger to encourage readers to read on. Or compose a clincher to summarize your key point with a punch. Or do both. And, of course, each sentence can keep a reader engaged or turn him off. Yet, your clincher sentence is more important than other sentences. If you’re into boxing, your clincher sentence is the knockout blow that makes readers see stars for a few hours. But I don’t like violence. So, I like thinking of the final image humming around in my readers’ minds—like a red poppy in sea of grey content. Very good! So good that I took an excerpt out of it and put it in my FB learning group, with a link back to your article – hope that’s OK! (But do let me know if not). Thank you for sharing, Claire. Happy writing. I’m printing this to refer to when I’m writing, Henneke. Your tips are immediately actionable and your writing sparkles. Thank you for your emails! Thank you for your lovely compliment, Dana. Happy writing! Thank you for the reminder and inspiring ideas, Henneke. Excellent information on a very specific and useful writing tool. I’ve saved your clincher/cliffhanger image to my blog inspiration folder. It may even go on the fridge! Thank you! Henneke never fails to deliver posts that make you sit up and go hmmmmmmmmmm. Thanks! Excellent information. I used this once without knowing it was a clincher sentence. To me it’s like preparing a nice dinner; add just enough seasoning or salt to give it that extra bit of kick before serving or enjoying. Agai​​​n, excellent information, and so needed. The best tip ever just like a bite-sized snack. Love this clincher concept, Henneke. Along with a blog post or book section, would you use clinchers and cliffhangers in an ecourse as way to build anticipation and keep people engaged? Yes, it works for ecourses, too. Depending on how the course works, each lesson (or module) can have a cliffhanger to explain what you’ll learn in the next section, a takeaway (summary of the main learning points), and an action point (perhaps an assignment). So funny, I had been thinking about using a food metaphor, too. I was thinking of a dessert to finish of your meal. Perhaps cheese with a glass of red wine, or would you prefer a sorbet? Once again great advice! I was never quite sure how to end my blog posts. I’m afraid most of them just end with no real conclusion or summary. I’m always learning with each tidbit of writing instruction you give. Thank you. Happy writing, Mary Ann. And thank you for stopping by. Really useful post Henneke. I was scrambling through the words to see your clincher sentence and it didn’t disappoint! The post reminds me of Stephen Covey’s “begin with the end in mind” habit which can apply to just about anything, including writing, and something I hadn’t thought about. Yes, great point about beginning with the end in mind. That is so true. Lovely post and super educational too! While, I might have written clincher sentences, unaware of the fact that they are that, your article gave a thorough lesson of this. Ultimately, it now dawned on me that, writing and the world of literature has so much more into it that it almost feels like fantasy to live on and on. To be honest, I knew about the principle of writing final sentences for a long time, but I learned the phrase “clincher sentence” only recently. Once you know about clincher sentences, it’s really interesting to pay attention to them and see which writers use them well and who don’t. Writing is so much fun because there’s always more to learn. I did these but didn’t know what they were called. I need to always make sure I am using them. Thanks, Henneke for the education! I only recently learned that these sentences actually have a name. Hardly anyone seems to explain what these sentences are. I learn so much in such an easy way. You are the best Writer’s Coach. Thank you for your lovely compliment, Shirley. What I love about thinking in terms of cliffhangers and clinchers is it challenges us as writers to be clear about the point we are trying to make, and the questions we want the reader to ask. It helps us shape the reader’s experience. You have such a gift for simplifying writing concepts! Yes, that’s so true! It about finding the best way to take our reader’s by the hand and guide him to his destination. As usual Henneke – your sound advice just when I need it most. I’ve always had trouble finishing chapters and you’ve summed up the solution wonderfully. Thank you from very cold Sydney. That makes me happy, Paul. I love it when guidance arrives at the perfect moment. I hope you’re keeping warm despite the cold! what I love best in your writing is the small summary with Henrietta … it sticks the info to my brain cells with a superglue. Well, I now need to go back and rewrite the ending to almost everything! 😀 But thanks to you, I also know how. What a lovely gift your post always is! Thanks so much! I rarely go back to improve old posts. I bet that if I tried I’d could improve them quite a lot, but I find it’s so much more interesting to write a new post and it’s not possible to do it all. Thank you for stopping by again, Katharine! To choose my option, I try to read my post through the eyes of my ideal reader and imagine what’s the best way to guide her to her destination. My hunch is that it doesn’t matter so much what option we choose as long as we don’t let our message float and our articles fizzle out. Happy writing! This is good Henneke. Really good. Like a 1 line summary of all you wrote about throughout the blog post. A home run sentence in many ways. If you can send off folks with an impact they will remember you. Yep, that’s it. And don’t forget that you can also summarize along the way (at the end of each section or paragraph) to keep readers on track. A clincher – I have to look up the literal meaning. Did not know there was a word for it! How very clever. Great post! Ah, decisive – klinknagel. Got it! There’s no word like that in Dutch. I only knew clincher as a decisive argument in a negotiation. Only recently, I discovered it’s also used for the last (decisive) sentence of a paragraph, essay or chapter. I don’t know a good word for it in Dutch either! There is none. I wonder which author wrote that book.. Damn.. How many writing books do you read, anyway? I rarely read books about writing these days. At some point, there’s nothing new in them anymore. I prefer reading fiction. This may be my favorite post of yours. Great examples. Hope you are doing well. Thank you, Chris. I see you’ve started a new podcasting project earlier this year. It looks good! I enjoy all your informative blogs unlike a few who have had impressed me as you do. But in spite of all the motivating write-ups, I am still in a dilemma from where to start. You must on facebook, can you give your link? I’m glad you’re enjoying my blog posts, Manaj. I don’t have a Facebook account. You may find that it doesn’t really matter where you start. Just start somewhere. I like the fact that we don’t have to choose either a clincher or a cliffhanger — we can use both at the same time if necessary. I guess it comes down to a case-by-case evaluation in the end — what would be most beneficial to your readers in a particular instance? Thanks for another example-laden article, Henneke. Your writing tips are always great, but the books you reference are the icing on the cake as they are always fascinating ? Yes, you can choose or do both. I don’t think it matters much. The key is to think about how you want to end a piece of writing or a section of that piece. I’m glad you’re enjoying my book recommendations. Thank you, Alison. I appreciate your regular comments. They’re really helpful to me. Thanks for the advice. I have been trying to improve my copywriting skills to use on my websites. I have been hiring writers to do it in the past but I want to do it myself. This tip will come in handy. Great. Thank you for your comment, Rich. Happy writing! As I typed in the name of your website, it popped up in my browser so it means I’ve visited your site before, but may not have actually read your blog posts. This is my first, and I LOVE the content and your writing style. As others have said, you simplify teaching points and make them a delight to read and learn from. This one on “clinchers” and “cliffhangers” is excellent. They’re not new to me, but your well-chosen examples bring them to life. Now, instead of doing this occasionally, I’ll integrate them in all of my posts. Thank you. You have a new fan. Welcome, Yvonne, and thank you for your lovely comment. It makes me happy to know that you feel inspired to apply my tips to you writing. Happy blogging! Thank you for the great advice, detailed explanation and useful examples. I feel I already use some of these techniques, I just didn’t think of them this way. Yes, many writers use clincher sentences naturally. Thank you for taking the time to comment, Mihaida. Happy writing! I can see my entire life evolving round those enchanting vocabularies, the teacher is something else, her sense of arrangement, is fantastic, and she is one out of a million. I am in love with the methods of teaching and I just hope I can put all these into practice. Thank you dear instructor, Pro. Henneke. I am grateful to you and I hope you start teaching again soon. Do, have a nice holidays. Thank you for your lovely comment, Paula. I’m glad you’re enjoying my blog! My daughter is writing her first article, about a raising money to build a school. I sent her this, and two other blog posts of yours. Found them in seconds. You’ve now inspired 3 generations of my family.